We serve the sheet metal and fabrication industries with a complete line of equipment, tooling & accessories. Press brake tooling is at the center of our service. The quality of the tooling is directly reflected in the quality & conformance of your finished part. Design, engineering, materials and workmanship are all critically important. We have an extensive inventory of shear blades for most plate & squaring shears. Shear blades are available in the exact alloy to suit your needs whether it be soft aluminum or the toughest armor plate. Need your old blades re-ground? We can turn them around in usually less than one week. Quickly set up for forming small & angled parts. Safely keep your hands out of the forming area. Available in both left & right hand versions. 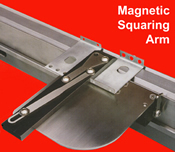 Magnetic Squaring Arms are available from stock. Eliminate or minimize marking on all materials with our Urethane Die Cover Film available in a variety of widths & thicknesses. Preventing abrasion at the source saves a costly secondary operation. Urethane Die Cover Film is available for same day shipment. Standard American press brake tooling, European precision ground & precision ground American style, all available from Press Brake Tool & Supply, Inc. Most standard punches & dies are on the shelf for quick shipment. We specialize in special applications with the most experienced engineers in the industry. Specialty Aircraft punches & dies are also available. Commonly referred to as the "Pac Man" die, the Rotary Bender provides unique solutions to a wide range of bending applications. Benefits include safer and more efficient material handling, mark free bending for pre-finished or high luster materials, improved part consistency, precise radius control and potential tonnage reduction of up to 50% over wiping dies. Whether for prototype or production bending, the Pro-Gage will reduce set-up time. With 4 axis adjustment you can quickly set up any job. Use the Pro-Gage separately or in conjunction with your CNC back gauge to provide additional flexibility. The revolutionary Rolla-V offers "mark free" bending, eliminates or minimizes distortion of holes and slots near the bend line & allows bending of previously "undoable" short flanges. A wide range of material thicknesses can be formed in a single Rolla-V. Whether forming single louver openings or multiple louvers in a single hit, Press Brake Tool & Supply, Inc can provide a die set for your Press Brake, Punch Press or Stamping Press. Each louver set is manufactured specifically for your exact application. Now, a patented milling process can restore your Press Brake bed and ram to like new tolerances right in your plant. No costly rigging and transportation, plus the whole process can usually be accomplished in just a few days. 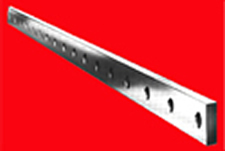 Even your die rail can be re-surfaced at the same time. All press brakes deflect. It's just physics. Eliminate shimming with our Deflection Compensation Die Holder, available in both single and multiple point adjustment models. Direct read-out allows recording of values for repeat jobs. With our multipoint unit, multiple staged jobs become a reality.